The extinction event at the end of the Cretaceous is often seen as something of a changing of the guard: the old Mesozoic fauna was swept away, leaving the world open for the (eventual) rise of our modern Caenozoic fauna. However, not every lineage that crossed the Cretaceous boundary remains with us today. Skull of Kamptobaatar kuczynskii in lateral view, without lower jaw. From Kielan-Jaworowska (1971). 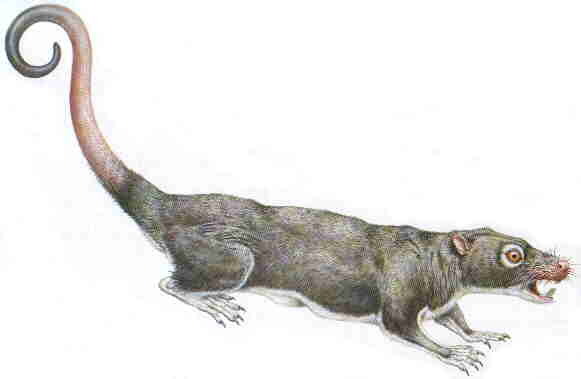 Multituberculates (multis to their friends) were a group of small, vaguely rat-like mammaliaforms that first appeared in the Middle Jurassic (but see comments later). The name 'Multituberculata' refers to their most distinctive character: the presence of a particularly large number of tubercles (cusps) on the post-canine teeth, in particular on the fourth premolars and first molars of the upper jaw. The first upper molars of Kamptobaatar kuczynskii, for instance, had ten cusps, arranged in two rows of five (Kielan-Jaworowska 1971). These multi-cusped teeth were faced on the lower jaw by a massively enlarged fourth premolar, which had become high and multi-ridged, like some sort of dental buzz-saw. These massive teeth, together with the loss of the canines in all but a few basal species (Kielan-Jaworowska & Hurum 2001), have been interpreted by most authors as indicating a diet of tough plant matter, like that of most modern rodents, though some small animals such as insects may have also been eaten. As such, multis are commonly regarded as the first mammaliaforms to show obvious adaptations for a vegetarian diet. Lower jaw of Kamptobaatar kuczynskii, showing reduced dentition between incisor and enlarged fourth premolar. From Kielan-Jaworowska (1971). For the most part, multituberculates are known from Eurasia and North America, though Hahnodon taqueti is known from the Lower Cretaceous of Morocco, and potential multituberculate teeth have been identified from the Late Cretaceous of South America (Kielan-Jaworowska & Hurum 2001). The Late Cretaceous Gondwanatheria may also represent South American relatives of the multituberculates (Gurovich & Beck 2009). A number of lineages of multis passed through the end of the Cretaceous apparently unscathed, and multituberculates remained a part of the Holarctic fauna up until the end of the Eocene. Their final extinction is usually attributed to competition from the increasingly diverse placentals, particularly the rodents (Kielan-Jaworowska et al. 2004). This may have been related to their reproductive biology: multituberculates had extremely narrow and rigid pelvic girdles that could not have spread much during birth, and they must have produced extremely small young in a similar manner to modern marsupials (Kielan-Jaworowska et al. 2004). Reconstruction of the North American Palaeocene multituberculate Ptilodus, from Cox (1998) via here. Some of you may have noticed that I have referred to multituberculates as 'mammaliaforms' rather than 'mammals': they were definitely the former, but it is more debatable whether they are the latter. Most modern authors restrict the name Mammalia to the mammal crown-group: that is, the smallest possible group including monotremes, marsupials and placentals. The question of where multis sit in relation to the mammalian crown-group requires me to mention another group of animals, the Haramiyida, that lived in the Late Triassic and early Jurassic. Haramiyidans have teeth similar to the distinctive arrangement of multituberculates, leading to the assumption when they were first described that they represented early multis (Kielan-Jaworowska & Hurum 2001). However, while multituberculates share a number of features of the non-dental skeleton (such as ear ossicles independent of the jaw) with modern mammals, haramiyidans have an overall anatomy of a much more plesiomorphic grade. If multituberculates are related to haramiyidans, as indicated by their teeth, they would be well outside the mammalian crown group, and would have evolved a number of convergent features independently of mammals. On the other hand, if one goes by the evidence of features other than the teeth, multis were closely related to mammals (either their sister group [Gurovich & Beck 2009] or within the mammal crown, closer to marsupials and placentals than to monotremes [Luo et al. 2002]) and haramiyidans represented an entirely independent acquisition of a multituberculate-like dentition. At present, an independent origin of multis and haramiyidans seems more likely, but it could easily be upset by future discoveries. Gurovich, Y., & R. Beck. 2009. The phylogenetic affinities of the enigmatic mammalian clade Gondwanatheria. Journal of Mammalian Evolution 16: 25-49. Kielan-Jaworowska, Z. 1971. Skull structure and affinities of the Multituberculata. Acta Palaeontologica Polonica 25; 1-41, pls 1-5. Kielan-Jaworowska, Z., R. Cifelli & Z.-X. Luo. 2004. Mammals from the Age of Dinosaurs: origins, evolution, and structure. Cambridge University Press. Kielan-Jaworowska, Z., & J. H. Hurum. 2001. Phylogeny and systematics of multituberculate mammals. Palaeontology 44 (3): 389-429. Luo, Z.-X., Z. Kielan-Jaworowska & R. L. Cifelli. 2002. In quest for a phylogeny of Mesozoic mammals. Acta Palaeontologica Polonica 47: 1-78. "Multituberculates (multis to their friends) were a group of small, vaguely rat-like mammaliaforms"
Not all of them were particularly small, though. Taeniolabis, for example, is estimated to have weighed about 30 kg, and it was thus similar in size to an extant beaver or a wombat. I must confess, I didn't know that. All the ones that I'd noticed size estimates for were in the range of Kamptobaatar at the top there. By the way, does anyone else see the silhouette of Barney the Dinosaur in the skull's eyesocket? This may have been related to their reproductive biology: multituberculates had extremely narrow and rigid pelvic girdles that could not have spread much during birth, and they must have produced extremely small young in a similar manner to modern marsupials (Kielan-Jaworowska et al. 2004). Is it known if they bore live young? I guess if they did, that'd be a strong argument for their being stem-therians? The super-narrow pelvis also argues against egg-laying: to be small enough to pass through, the egg would have to be considerably smaller relative to adult size than any known amniote egg. So it does seem most likely that multis bore live (though exceedingly small) young, just like marsupials. I do agree that it is a good point in favour of stem-therian-ness (and that does seem more likely to me than the haramiyid connection), but there are two points I would keep in mind: (1) viviparity has appeared in amniotes more than once (in fact, I think the number of appearances may be well into the double figures among lizards), and (2) monotremes have pouches as well, so pouches were probably around in the mammalian lineage before viviparity.
" At present, an independent origin of multis and haramiyidans seems more likely, but it could easily be upset by future discoveries. " Three years later, the stem-mammal placement for haramiyidans continues to look like the best solution. Arboroharamiya is a basal multi, not a haramiyidan. I'm inclined to agree with you on that one, Nick.